The boy has been asking me, for the longest time, to send him for soccer lessons and finally, we found one Saturday where we had the afternoon free! So here we are, at Victoria Junior College where JSSL-Arsenal conducts their soccer lessons. I was expecting a small set up with a few kids but what a surprise it was for me to find the entire field occupied by children of various ages and skill levels. I quickly registered the boy and we were sent accordingly to the 5 and under group. We soon found one of the boy's classmate and before I know it, he was off and lesson was starting. The coach had the boy go up in front of the group to introduce himself before starting the practice session. I must say I found it to be a very professional and fun environment. The coaches were able to engage the children and the kids seem to really enjoy themselves. I like that they constantly reminded the children to drink lots of water too. Here's one of the exercise they kids did. Aside from fun routines, the children were broken up into teams and they would be playing three-a-side, then six-a-side matches. It was fun to see the four and five years old playing a match. And, of course, you can see that the parents were very excited too, calling out to the kids from the sidelines! The location is convenient for us as it's about 10 mins walk away. There is another football school nearer to us, however, they only accept children age 7 and above so the boy, being only 5 years old, is unable to join them. In the case of our trial session at JSSL-Arsenal, we were both so pleased at the end of it, I went ahead to register the boy and got his jersey printed with his name and he choose to put #8 on the back. There are many football schools around various locations in Singapore. For the sake of the parents who are usually the ones sending the kids, I usually prefer the training ground to be as close to home as possible. 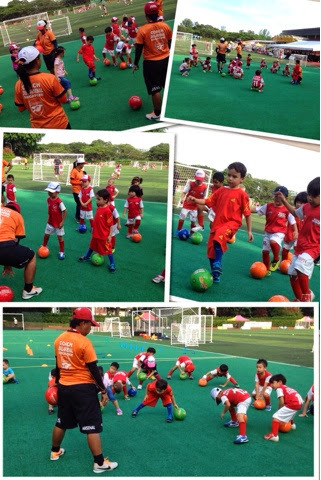 Here are some football/soccer schools for little ones spread all over Singapore. To be honest, we have only been to JSSL-Arsenal so I cannot tell how good or bad the rest are. It's always prudent to go for a trial lesson first or if you are lucky and have a few near you, check them all out before deciding. And of course, if you are an avid fan of a particular soccer team/club, then by all means, send your child to the school of the club you support. This is a good way to bond with your child, having a common interest.